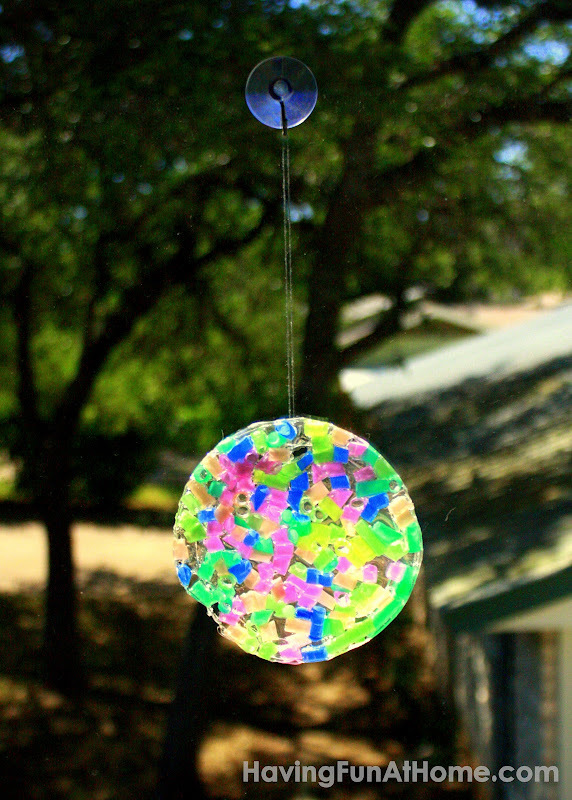 I was thinking the other day about the Elmer's glue suncatchers my aunt used to make with my cousin when she little. I had been trying to think of something colorful and a little translucent we could make them with when I noticed some pretty and bright drinking straws at the grocery store. You can arrange the straws in a design or just sprinkle them randomly. It will look prettiest if you fill as much of the lid as possible. Set to dry. It will take several days, maybe even a week, to harden. Pull the suncatcher out of the plastic lid. It may curl a little after you take it out. If so, you can put it under a heavy book for a couple of hours to flatten it out. Use a needle to push a piece of thread through the top of your suncatcher and attach to a suction hook so that you can hang it on a window. So pretty! For another drinking straw activity, try using them with playdough! So pretty! I like the idea of using pieces of straws. They look just like beads. So cool! Love the straw piece idea - nice and lightweight! This glue is a good choice because the evidence is not so obvious and cannot affect to the outcome of the project. No mess in using this. Oh, what a fun idea for gramma to do with her grandkids!!! Thanks! What a great idea!! I will definitely give this at try. I would love it if you would share at our link party at http://craftymomsshare.blogspot.com/2012/04/sharing-saturday-17.html. I'm your newest follower. Thank you!! What a pretty craft! I love how the sun catches the colors of the straws. I am LOVING your website and have pinned about a billion crafts for me and my almost three year old to do! Thanks! I know this is late...did this glue stay pliable/soft? Or did it dry hard and breakable? Thanks! Great idea! Leftover Easter Egg Idea: The Pool!